Oral cancer is a disease of disparity. There is a significant disparity in the incidence of the disease around the globe. Being a disease caused primarily by local risk habits of tobacco, areca nut, and alcohol over 70% of the global burden of oral cancer is encountered in South-East Asia. In developed nations too, it occurs in underserved, marginalized strata of the society. Oral cancer is a potentially preventable and curable disease. Preventable risk habits of oral cancers are known. Simple noninvasive measures are available for early detection, and if detected early, the cure is possible with well-standardized, affordable treatment. Despite this fact, the disease outcome has improved only modestly. Moreover, there exists significant disparity in the outcome of the disease, both within developed nations and between developing and developed nations. This can be attributed to access, affordability, and compliance to health care. It has been demonstrated in large population-based studies in the US that although the incidence of oral cancer is declining, the patients presenting with locally advanced stage disease is increasing. Despite this fact, there is a about 11% improvement in survival from 53.6% between 1982 and 1986 to 62.9% between 2002 and 2006 [Table 1]. In India too, the incidence of oral cancer has declined by 6.4% from 1990 to 2016. However, about 90% of oral cancers in India and 65% of patients in the US are diagnosed at Stage III and IV. Advanced stage of presentation is a global issue of oral cancer. The stage of diagnosis has a major impact on disease outcome. Although majority of oral cancer patients in both the US and Indian population presents with advanced stage of disease, there is about 4-fold higher mortality in India compared to the US population (1.2 vs. 4.9 ASR mortality per million in the US and India, respectively). The cost of cancer care increases with stage. The current cost of cancer care in India is about 5-fold lower than that of the US. Ernst and Young has projected that by 2020 the cost of cancer care in India will increase by 3-fold with generic medicines and about 5-fold with innovators molecules. This is primarily driven by the introduction of several novel therapeutic modalities. As advanced stage disease is the primary clinical problem, almost all novel interventions in cancer have been directed to the management of advanced stage disease. It is to be noted that all these innovations although push the cost of treatment high, the impact has been rather modest. Continuing the present strategy to manage oral cancer, will improve the cancer care outcome, albeit in a snail's pace. The question is whether we can conceive strategies to leapfrog the outcome without increasing the cost of treatment. This is a requirement not only for India but even for developed nations. As India, has reaching the tipping point with respect to increasing cancer burden and cancer care cost, it is most acute for the country. India's approach for innovation, in general, is different from other nations. Developments in India often adopt the Jugard principles focusing on frugal innovation. This approach when coupled with disruptive technologies is expected to leapfrog and transform cancer outcome. Oral cancer being an Indian problem, the solutions for this issue must come from within. Being a global citizens, the novel development strategies should have global applicability. We propose two major strategies: (1) development of affordable technology to downstage the disease, with the plan to increase the Stage I and II disease from 10% to 50% by 2030 and (2) improve the cancer delivery process so that cancer care becomes accessible and affordable. For both these strategies, adoption of currently available digital technology will enable bringing specialists care to the patient's home and seamlessly interconnect cancer care to improve efficiencies through minimizing redundancies. In a comparative study of the US and Indian population, Yeole et al. have demonstrated that the outcome of oral cancer in India is about 20% lower than in the US population. While the difference in disease outcome was to 26.5% with loco-regionally advanced stage disease, with early-stage disease, it was comparable [Table 2]. This data suggest that with the available cancer treatment resources in India, one can obtain similar outcome as that of developed nations, provided the disease is diagnosed at an early stage. In the landmark randomized clinical trial, Sankaranarayanan et al. has demonstrated that mouth examination by trained health workers can reduce the cancer-related mortality in high-risk group from 45.4/100,000 in the control arm to 29.9/100,000 in the interventional arm. They have also demonstrated that this intervention is cost-effective with cost per life-year saved in the high-risk group was  No oncology interventions in the past three decades had this level of clinical impact. However, this important finding has not yet been adopted into clinical practice. This is contrast to much low impactful, high-cost pharmaceutical interventions. This is likely to change with the use of digital technologies. Although the Sankaranarayanan study has demonstrated reliability of clinical examination for early detection of oral cancer by trained health workers, the bottleneck of societal adoption and scalability was trained workforce, which is a scarcity. In a study, our group tested the hypothesis whether mobile phone can replace trained workforce. In this study, mobile phone with a custom developed app was provided to interrogate oral cavity in a community setting. The clinical data and images of oral lesions were remotely interpreted by oral oncology experts. It was demonstrated excellent concordance of direct examination and remote interpretation of the data transmitted through mobile phone in the hands of general dental practitioners. As the white light examination has limitations, several adjuncts such as autofluorescence and toluidine blue has been attempted in the past without success. This is mainly because of the fact that none of these interventions are cancer specific. To get around this issue, we tested the feasibility to Sambucus nigra (SNA) lectin and wheat germ agglutinin (WGA) lectins that specifically binds to abnormal glycosylated proteins which are unique to cancer cells. In ex vivo and in vivo clinical trials we have demonstrated that the induced fluorescence with these lectins have the potential to distinguish normal, nondysplastic, and dysplastic oral potentially malignant lesions (OPML) and invasive cancer. Although oral cancer could be suspected in the community, unless there is tissue diagnosis, one will not be able to initiate treatment. As biopsy is not feasible in the community setting, referral to secondary care is necessary. Compliance to recommendation for biopsy of incidentally detected asymptomatic lesion is poor. Cytology is a universally established technique for histologic diagnosis of solid tumors. This has been adopted as cancer screening tool, especially Pap smear More Details in cervical cancer. Although its reliability is OPML is questionable, it is used in the community setting to diagnose oral cancer. Logistics of obtaining smear, sending to specialist centers for interpretation, and relaying the results back to the intended person is a logistic challenge. To overcome this challenge, we tested the feasibility of remote interpretation of the cytology images in a telecytology platform called CellScope. This involved capturing cytology images at the point-of-diagnosis using a tablet device and sending selected images to experts' desktop for remote interpretation. On comparing this system versus the gold-standard of direct microscopy revealed excellent concordance. This technology, however, could not overcome the inherent problem of cytology of its inability to diagnose dysplastic lesions, interobserver variability as well as inability to offer real-time diagnosis. To overcome these issues, we attempted molecular cytology using fluorescent labeled lectins and Poly (ADP-Ribose) Polymerase-1 (PARP-1) inhibitor. This demonstrated improvement in diagnostic accuracy of 81% sensitivity and 83% specificity for PARP and 93.9% sensitivity and 73.9% specificity for Lectin. As both these markers target different anatomic locations of cell surface for Lectin and nucleus for PARP, there was also synergy between the two. To further improve the diagnostic accuracy as well as the ability for point-of-diagnosis reporting for potential community application we attempted the feasibility of artificial intelligence (AI) to interpret cytology images. This utilized convoluted artificial neural network machine learning algorithm. This improved the sensitivity and specificity of 61.4% and 75% observed with conventional microscopy to 87% and 100%, respectively with AI [Table 3]. Overall, mobile health technology has the potential to take the expertise to the point of diagnosis, rather than waiting for the patients to reach an expert. Almost all the current diagnostic modalities from visual examination, light-based adjuncts, vital staining to cytopathology are images. All images can be digitized and transmitted to an expert for remote interpretation. If one incorporates the power of AI, there is the feasibility of true, point-of-diagnosis assay even without human intervention, minimizing the need of expertise, and taking expertise to the people's home [Figure 1]. These technologic advances have the potential to significantly down-stage oral cancer. However, unless one addresses the much-needed improvement in the process of cancer care, one may not be able to translate this finding to improvement in the disease outcome. An alternate approach is to increase the number of cancer centers throughout the country. This is attempted in the state of Kerala. It has three regional cancer centers and cancer centers in all government medical colleges and an increasing number of cancer centers in the private sector. The state has a population of 33 million and annual incidence of 66,000 new cancers. The number of cancer treatment facilities in the state grew from 3 in 1980 to the present number of 31 centers. Even with this increasing number of cancer centers, there is a steady increase in cancer incidence from 74 to 135 per 100,000, the highest incidence of India. The projected cancer mortality also has steadily increased from 15,000 to 30,000 during 10-year span of 2006–2016. This underscores the fact that bigger cancer centers or more cancer centers do not improve cancer outcome. What is required is a decentralized, distributed, digitally connected cancer care model. In a decentralized, distributed cancer care model, cancer treatment facilities are stratified based on the available resources (infrastructure and clinical expertise) and clinical needs of the society. Accordingly, cancer care facilities could be stratified in four levels. 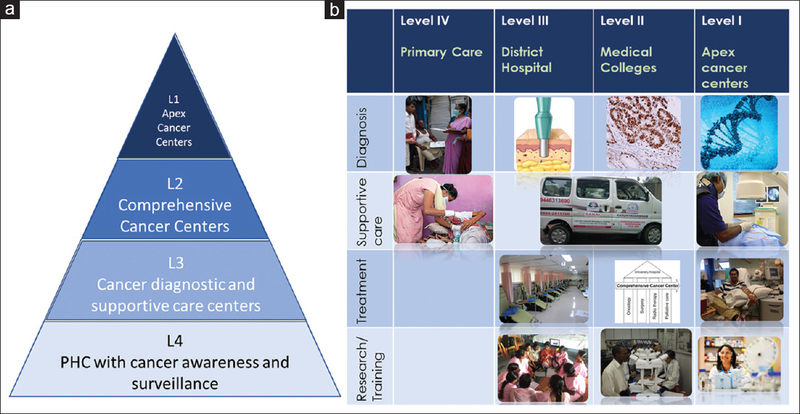 Level-1 apex cancer center, Level-2 comprehensive cancer centers, L-3 Community cancer centers, and Level-4 cancer surveillance services at primary health centers [Figure 2]. Each of the different levels will have different infrastructure needs and expertise requirements. Level 4 centers that lie on the bottom of the pyramid offers foundation to the entire cancer care program. These are established at primary health centers. The primary health-care doctors and public health nurses form the anchors of this service. They are trained to identify common cancers (oral, cervix, and breast) and offer support during cancer treatment. Their training will be carried out by Level 2 comprehensive cancer centers. Their mandates are to work with local self-governing organizations and non-governmental organizations to improve cancer awareness among the public, suspect common cancers are a timely referral to Level 3 centers for confirmation of diagnosis. They also have the responsibility to offer supportive care during cancer treatment. Level 3 is community cancer centers. They are located in the Taluk hospitals. Their mandates are to offer diagnostic services for the patient referred from Level 4 centers, palliative intent day-care chemotherapy, rehabilitation and pain, and palliation care. Level 2 centers are comprehensive cancer centers established as a part of medical colleges and multi-specialty private hospitals. These centers offer advanced diagnostic facilities for all cancers, comprehensive cancer treatment, train cancer specialists as well as primary care doctors and health workers. Level 1 centers are apex cancer centers. Once majority of cancers are managed in the community level, the process with decongest the turgid current workload of apex cancer centers. This enables these centers to focus on the activities the current situation that precludes the apex cancer center from performing. Those are (1) advanced molecular diagnostics, (2) advanced interventional pain management, (3) care for advanced and complex cancers, (4) translational research, and (5) train next-generation clinician-scientists. All these levels of cancer care should seamlessly integrate between themselves as well as with the existing health-care system. For sustainability and to provide comprehensive health care for cancer patients, the cancer care must integrate with prevailing public and private health-care system. This integration allows standardization of cancer care in the community that will be based on the need rather than affordability of an individual. The digital technology has the potential to integrate cancer centers and seamlessly offer true comprehensive cancer care. This digital connectivity can take advantage of the government of India's digital knowledge highway or the proposed the National Cancer Grid Digital Connectivity. Health care is all about process, protocol, and price. Although there are several well-characterized protocols for oral cancer care, implementation for the benefit of the end-users is a challenge. Recently, the National Cancer Grid has launched a resource-stratified guidelines for cancer care into basic and optimal. Basic care is the one that can be provided with the government insurance. The optimal care is that could be offered with out-of-pocket supplement or through private insurance. There are several examples in health care on how simple technology such as SMS alerts to improve adoption of standardized protocol in low-resource setting. Mama Bangladesh is one such program. In this perioding SMS, health alerts are given to improve maternal and child care. It has demonstrated that the program enabled safe delivery in 77% of participants, promoted exclusive breastfeeding in 83% and immunization in 96%. In oncology also there are similar examples such as Chemocare programme of Wales. It is led by community nurses (not medical oncologists) to offer chemotherapy services closer to the patient's home and remotely monitored using mobile phone app by the specialists. Teleradiotherapy with remote planning of radiotherapy is established in Switzerland. Almost every aspect of oncology care can be digitally monitored to ensure coordinated, standardized care. This includes telepathology, teleradiology, and teleconsultation. Virtual tumor board of the National Cancer Grid India, the use of ECHO platform for training of primary care doctors by the National Institutes of Cancer Prevention, New Delhi, are early examples of adaption of digital technology to democratize standardized cancer care. Care of cancer is one of the major reasons for catastrophic poverty of the nation. The cost of cancer treatment is spiraling out-of-control even for the most advanced economies. This escalation of treatment cost will come to a tipping point when no nation in the world will be able to adopt all available treatment options. It has already reached a tipping point in developing countries such as India. Escalating cancer care cost, especially with increasing availability of newer targeted molecules, genomic diagnostics are a major concern worldwide. Two major steps can be considered to contain cancer care cost: (1) down-staging cancer at diagnosis and (2) improving logistics of cancer care. Measures to down-stage cancer and improving treatment logistics have been discussed before. By offering cancer care closer to patients' home, one can substantially reduce out-of-pocket expenses. Although oral cancer high-prevalent countries such as India is lagging behind cancer outcome, adopting technology, one can expect leapfrog in cancer outcome. One would see significant down-staging of oral cancer at diagnosis. Technology further improves cancer care process and facilitates adoption of resource-stratified guidelines in cancer care. By the combination of these measures, one can expect lowering cancer care cost and improving disease outcome. Countries such as India will be able to lead this much-needed innovation, which may be adopted elsewhere in the world. Pulte D, Brenner H. Changes in survival in head and neck cancers in the late 20th and early 21st century: A period analysis. Oncologist 2010;15:994-1001. Call for Action: Expanding Cancer Care in India. Ernest and Young Report; 2015. Available from: https://www.ey.com/Publication/vwLUAssets/EY-Call-for-action-expanding-cancer-care-in-india/$FILE/EY-Call-for-action-expanding-cancer-care-in-india.pdf. Yeole B, Sanakaranarayanan R, Sunny L, Swaminathan R, Parik DM. Five year relative survival of oral cancers in Mumbai and the US SEER population, 1992-1994. Cancer Causes Control 2003;14:945-52. Subramanian S, Sankaranarayanan R, Bapat B, Somanathan T, Thomas G, Mathew B, et al. Cost-effectiveness of oral cancer screening: Results from a cluster randomized controlled trial in India. Bull World Health Organ 2009;87:200-6. Birur PN, Sunny SP, Jena S, Kandasarma U, Raghavan S, Ramaswamy B, et al. Mobile health application for remote oral cancer surveillance. J Am Dent Assoc 2015;146:886-94. Baeten J, Suresh A, Johnson A, Patel K, Kuriakose M, Flynn A, et al. Molecular imaging of oral premalignant and malignant lesions using fluorescently labeled lectins. Transl Oncol 2014;7:213-20. Skandarajah A, Sunny SP, Gurpur P, Reber CD, D'Ambrosio MV, Raghavan N, et al. 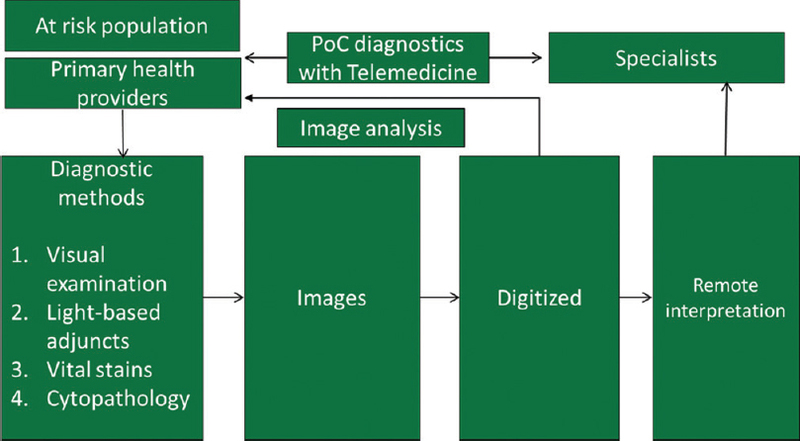 Mobile microscopy as a screening tool for oral cancer in India: A pilot study. PLoS One 2017;12:e0188440. Dhillon PK, Fitzmaurice C, Kumar GA. The burden of cancers and their variaitons across the states of India: The global burden of disease study 1990-2016. Lancet Oncol 2018;S1470-2045:30447-9. Government of Kerala Cancer Control Strategy; 2018. Shetty DP. Personal Communication. Narayana Health City, Bengaluru. National Cancer Grid. Available from: http://www.NCG.org. [Last accessed on 2019 Nov 02].